The Blue Certificate initiative, the Swiss Agency for Development Cooperation (SDC), and 2030 WRG, organized a meeting in Arequipa on June 29, 2018 to talk about the certification process. Members of the initiative also presented a few case studies that showcased companies that have already been awarded. The Blue Certificate initiative was launched in 2016 by the Peruvian government, with the help of 2030 WRG, to encourage businesses to measure and reduce their water footprint. The Blue Certificate is officially recognized by the Peruvian National Water Authority (ANA) to companies who have fulfilled three criteria: 1) actively measure corporate footprint; 2) have created a water reduction plan for their operations; and 3) have developed a shared valued project for their surrounding communities. 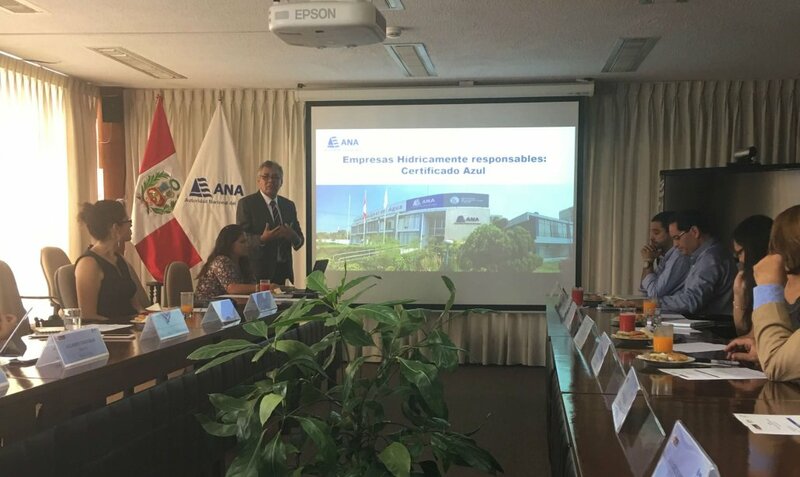 More than 30 companies in Arequipa participated in the recent event that was co-chaired by the Chief of ANA, the SDC Director of Cooperation, and the 2030 WRG Latin America Regional Coordinator. Two members of the 2030 WRG Steering Committee, Mercedes Castro from Agualimpia and Julia Torreblanca from Cerro Verde, also attended the event. Two additional companies from Arequipa—Plastisur, a member of Mexichem Group, and Cerro Verde—expressed their interest in this certification process. A second meeting was held in the region of Ica region on September 6, 2018 to present the certification process. More than 50 companies participated in the event. During this meeting, which was headed by the General Manager of ANA and the Regional Governor of Ica, Agrícola Don Ricardo expressed its interest in participating in the certification process. So far, 13 companies have either received certification or are in the process of getting certified. ANA is expecting to save 79,000 cubic meters of water and reuse 137,000 cubic meters of wastewater per year through the Blue Certificate initiative. More than 1.3 million dollars will be invested by the companies involved in the certification process, benefiting 30,000 citizens. To amplify the impact of the Blue Certificate initiative, the Peruvian Government will work to expand the initiative to other regions in Peru.